Can you even believe it? I cannot believe it. Just kidding, I can totally believe it. Ubisoft’s much anticipated online shooter The Division launched tonight, and its servers are not doing so hot. I’ve been trying to play the game on PC for the last hour, and have been hit with with endless “Sierra” errors, each with a different number. Sometimes I get “Romeo.” Uplay itself gives me an error that says that the service is down, and it doesn’t even seem able to sync my achievements. The Division requires an internet connection at all times, so if your link to the servers goes down (or the servers themselves go down) you can’t play at all. Kotaku’s Luke Plunkett was able to play from Australia for about five hours earlier today on PC, but he’s unable to connect now. It seems safe to assume that everything went to hell when North American players were allowed on a little while ago, at midnight Eastern. 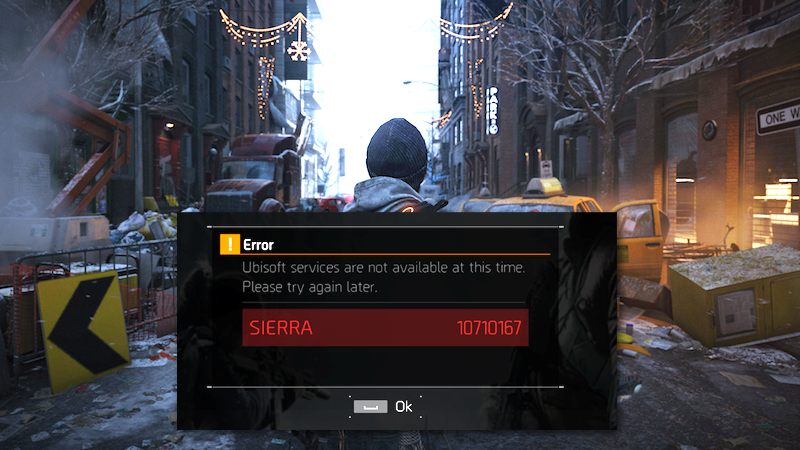 Given that The Division had two betas, I’d been hoping the launch would go more smoothly. I suppose this kind of thing really is to be expected at this point. Hopefully they get the ship righted soon and we can all go about finding out whether this game is actually any good. We’ll keep you updated as things progress. In the meantime, if you have the game: What platform are you on, and are the servers working for you? Update 2:10 AM: The servers are now letting more people get in. Luke and I have been able to log in on PC, though plenty of others are still reporting being unable to play. As is usual with big launches like this, your mileage will probably vary for a while. I’ve updated this article’s headline to more accurately reflect the game’s current state. Update 2:30 AM: In an update on the Ubisoft forums, a Ubisoft support representative says “All services have resumed normal operation on all platforms. We are monitoring the situation.” Lots of users still reporting issues, but surely that’s a promising sign.